The BL368 15 Watt 11" T5 Replacement UV Bulb single bulb replacements for the Mergence fly control system. Comes in shatterproof and non shatterproof models. Sylvania brand T5 15 watt BL368 UV bulbs feature the newest technology in ultraviolet lamps. The bulb lasts significantly longer with less dimming and is more attractive to flies.Recent improvements in Phosphor technology have led to a new generation of UV-A lamp with much improved insect attraction efficiency. This range, called BL368, is a premium high performance range. Two major improvements: 1. The energy distribution of the BL368 lamp is a much narrower band concentrated around the spectral peak at 368nm. This is widely accepted as the most important frequency for the attraction of flying insects. The radiation at 368nm is twice as powerful as from BL350 tubes, and because of this the lamp attracts many more insects. 2. Furthermore, the depreciation of UV-A output over time is significantly reduced. After 5000 hours of operation, the lamp maintains 80% of its original 100% output. The result is that it performs longer and better throughout the season. The lamps exist in linear, circline and compact versions. They are electrically and dimensionally equivalent to other fluorescent lamps of similar ratings. Besides insect trapping they also enjoy widespread applications in diazo printing machines, chemical processing, photo polymerisation and mineral detection. A new application, mostly for compact lamps, is nail curing devices. 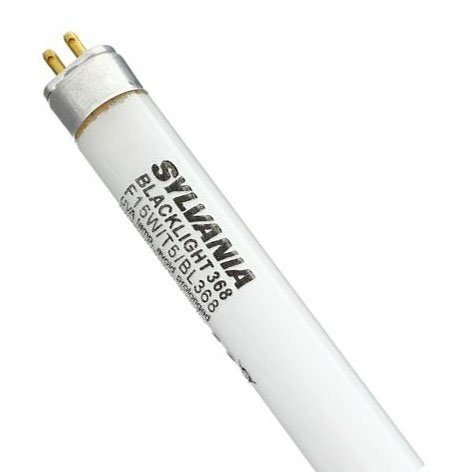 Sylvania's compact BL-lamps guarantee that the drying process does not last longer than 2 minutes. The result is naturally shining and strong nails. 11w 365nm UVA U type Tube lamp by Pest Be Off!